I think celebrations must be toasted with sweets. And for my special occasions, I don’t leave anything to chance. 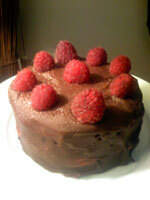 (I like to make my own birthday cake.) For my graduation from Stern I made sure that I made the celebration cake. 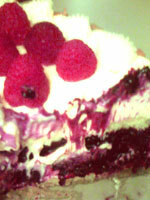 My family was in town and I know what they like: rich and intense fruit mousse cakes. This makes a giant cake and is best when you serve it all at once. There was plenty to give away to the neighbors. In a saucepan on medium head, cook the frozen raspberries, zest and sugar until bubbling. Mix the cornstarch and water into a slurry. Quickly stir the slurry into the raspberries, stirring until it turns clear and thick. Set aside to cool. Beat the egg yolks until they are thick and turn a light lemon color, set aside. Melt the chocolate in a pan over another plan filled with one inch of water (or a double boiler). Beat it with a wire whisk while cooking to make sure it is thoroughly melted. Let it sit at room temperature, stirring occasionally to make sure it doesn’t turn back to a solid block. Mix the yolks into the cooler chocolate, making sure that the yolks are not scrambling. Wisk the egg whites, sugar and cream of tartar in a stand mixer. Mix until the whites form stiff peaks. Slowly fold in the chocolate mixture. Whip the cream, vanilla and salt until stiff peaks form. Fold it into the chocolate and egg mixture. Cover and refrigerate while you finish making the other parts of the cake. Heat the water and sugar in a saucepan until the sugar is dissolved. Mix in the liquor and pop in the refrigerator to cool. Dip the cake in the sugar and liquor mixture. Line the sides and bottom of a 10-inch spring form pan with the cake. Add in half of the raspberry mixture and smooth. Layer it with one half of the mousse. Dip the rest of the cake in the sugar and liquor and layer on top of the mousse. Continue to layer with the raspberries and then the rest of the mousse. Refrigerate over night, covered. Just before serving wash and drain the raspberries. Then whip the cream and sugar until stiff peaks form. Put the whipped cream into a plastic bag. Remove the collar on the cake. 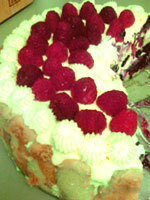 Pipe the whipped cream into patterns on the top of the cake and fill in the rest of the area with fresh raspberries. Serve immediately. To me, Christmas means desserts. This year I spent Christmas eve in New York City with some of my closest friends. It took two days for me to make this cake and it was worth every second. This is so rich and impressive looking. Unfortunately after just one piece, I was satiated. Pre heat the over to 350 degrees. Heavily grease one 10 inch round cake plan. Combine all of the dry ingredients in the bowl of an electric stand mixer with a spoon. Put the bowl into the mixer and add all of the wet ingredients. Beat the batter on low with the balloon whisk. Once the ingredients look combined, scrap down the sides with a rubber spatula and then mix the batter on high till it turns a lighter brown color. Pour the cake batter into the cake pan and cook for at least 3o minutes or until a wooden pick inserted in the center comes out clean. Let the cake cool in the pan, on top of a wire rack, for 10 minutes. Invert the cake onto the wire rack and gently tap the bottom of the pan. Lift the pan and let the cake cool completely on the wire rack. Once the cake is cooled, using a serrated knife, cut the cake into two equal rounds. To prepare the chocolate and strawberry mousse, reserve the 12 best-looking strawberries to decorate the top of the cake. In a food processor fitted with a metal blade, puree 10 strawberries and then strain it, to remove the seeds, so that it yields ½ a cup of puree. Set aside until needed. Refrigerate the remaining berries until needed (that includes the 12 berries for decoration) Heat 1-inch of water in the bottom half of a double boiler over medium heat. 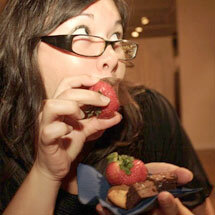 Place 16 ounces semisweet chocolate, the white chocolate and the strawberry puree in the top half of the double boiler. Tightly cover the top with film wrap. Allow to heat for 12 to 14 minutes. Remove from the heat and stir until smooth. Transfer to a stainless steel bowl, using a rubber spatula to remove all of the melted chocolate mixture. Keep at room temperature until needed. In the bowl of an electric mixer fitted with a balloon whip, whisk the 6 egg whites on high until soft peaks form, about 2 minutes. Continue to whisk on high while gradually adding 2 tablespoons sugar. Whisk until stiff but not dry, about 30 seconds. 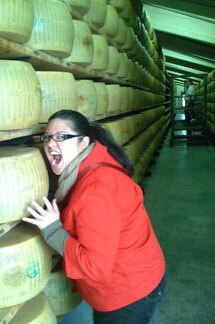 Set aside at room temperature until needed. Assemble a 10 inch springform pan. Place one layer in the bottom of the pan, trim ever so slightly, if necessary to get it to snuggle fit. 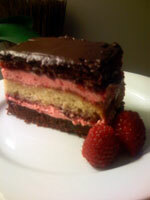 Spread 1/2 cup of chocolate strawberry mousse onto the cake layer in the assembled springform pan. Arrange the reserved strawberries (not including the 12 for decoration), stem side down, into the mousse. The berries should be arranged in 2 rings: the first ring being 3/4-inch from the outside edge of the cake, and the second, inside ring, 3/4-inch away from the first. Distribute the rest of the mousse over the berries, being careful to keep the berries in position. Holding the pan by the top rim, gently but firmly tap the bottom of the pan 2 to 3 times on your work surface (this will eliminate air pockets). Position a cake layer on top of the mousse and gently press into position. 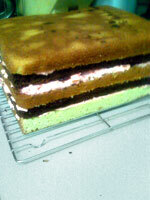 Refrigerate the cake for 2 hours (do not freeze). Make the ganache. Heat the heavy cream, butter, and sugar in a 2 1/2-quart saucepan over medium-high heat. When hot, stir to dissolve the sugar. Bring the mixture to a boil. Place the chocolate in a stainless steel bowl. Pour the boiling cream over the chocolate and allow to stand for 5 minutes. Stir until smooth. Allow to cool to room temperature. Remove the sides from the springform pan (do not remove the bottom of the pan from the cake; this will make it easier to handle later). 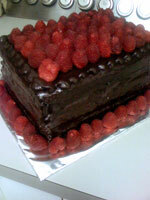 Use a cake spatula to smooth and fill in the sides of the cake with 2 to 3 tablespoons of room-temperature ganache. 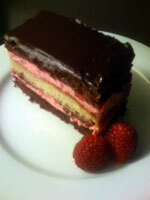 Evenly spread the remaining amount of this ganache over the top and sides of the cake. Refrigerate the cake for 1 hour. Whip the heavy cream and vanilla until it is full and thick. Transfer the whipped cream into a piping bag fitted with a star tip. Pipe rosettes around the edge of the cake and a large one in the center of the cake. Place a strawberry, stem side down, into each whipped cream rosette. Refrigerate the cake for 30 minutes. 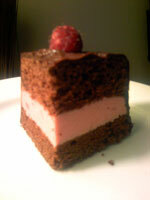 Cut the cake with a serrated slicer, heating the blade of the slicer under hot running water before making each slice. 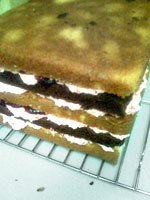 Allow the slices to come to room temperature for 20 to 30 minutes before serving.